This majestic soap also contains cocoa butter, shea butter, vitamin E almond and is 100% vegetable based. This spectacular soap is crucial to rejuvenating and moisturizing the skin. African Halal Black soap is one of the oldest soap in the market helping millions faces and body . Its made out African Shea Butter ,Cocoa Butter,vitamin E & palm oil ,which is very healthy for faces and the skin. 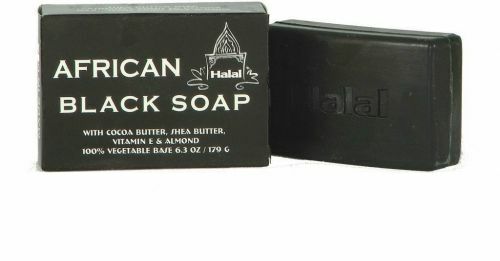 African Halal BLACK Soaps help deep clean skin. African Halal BLACK Soap works on most skin types including rough and dry or sensitive skin. Its helps clear skin bumps and spots by using black soap daily. Its Helps relieve acne, oily skin & other skin problems. African Halal BLACK Soap is also great for removing makeup. African Halal BLACK Soap benefits against premature facial lines and wrinkles. African Halal BLACK Soap can also be lathered and used as effective shampoo. Its one of the best soap for entire body .